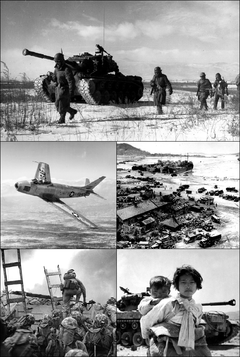 ↑ As per armistice agreement of 1953, the opposing sides had to "insure a complete cessation of hostilities and of all acts of armed force in Korea until a final peaceful settlement is achieved". ↑ Rottman, Gordon L. (২০০২)। Korean War Order of Battle: United States, United Nations, and Communist Ground, Naval, and Air Forces, 1950-1953। Greenwood Publishing Group। পৃষ্ঠা 126। আইএসবিএন 9780275978358। সংগ্রহের তারিখ ১৬ ফেব্রুয়ারি ২০১৩। A peak strength of 14,198 British troops was reached in 1952, with over 40 total serving in Korea. Jack D. Walker। "A Brief Account of the Korean War"। Information। Korean War Veterans Association। সংগ্রহের তারিখ ১৭ ফেব্রুয়ারি ২০১৩। Other countries to furnish combat units, with their peak strength, were: Australia (2,282), Belgium/Luxembourg (944), Canada (6,146), Colombia (1,068), Ethiopia (1,271), France (1,119), Greece (1,263), Netherlands (819), New Zealand (1,389), Philippines (1,496), Republic of South Africa (826), Thailand (1,294), Turkey (5,455), and the United Kingdom (Great Britain 14,198). ↑ "Land of the Morning Calm: Canadians in Korea 1950 - 1953"। Veterans Affairs Canada। Government of Canada। ৭ জানুয়ারি ২০১৩। সংগ্রহের তারিখ ২২ ফেব্রুয়ারি ২০১৩। Peak Canadian Army strength in Korea was 8,123 all ranks. ↑ Zhang 1995, পৃ. 257. ↑ Shrader, Charles R. (১৯৯৫)। Communist Logistics in the Korean War। Issue 160 of Contributions in Military Studies। Greenwood Publishing Group। পৃষ্ঠা 90। আইএসবিএন 9780313295096। সংগ্রহের তারিখ ১৭ ফেব্রুয়ারি ২০১৩। NKPA strength peaked in October 1952 at 266,600 men in eighteen divisions and six independent brigades. ↑ Kolb, Richard K. (১৯৯৯)। "In Korea we whipped the Russian Air Force"। VFW Magazine। Veterans of Foreign Wars। 86 (11)। সংগ্রহের তারিখ ১৭ ফেব্রুয়ারি ২০১৩। Soviet involvement in the Korean War was on a large scale. During the war, 72,000 Soviet troops (among them 5,000 pilots) served along the Yalu River in Manchuria. At least 12 air divisions rotated through. A peak strength of 26,000 men was reached in 1952. ↑ "Records of American Prisoners of War During the Korean War, created, 1950 - 1953, documenting the period 1950 - 1953"। Access to Archival Databases। National Archives and Records Administration। সংগ্রহের তারিখ ৬ ফেব্রুয়ারি ২০১৩। This series has records for 4,714 U.S. military officers and soldiers who were prisoners of war (POWs) during the Korean War and therefore considered casualties. ↑ "Korean War WebQuest"। Veterans Affairs Canada। Government of Canada। ১১ অক্টোবর ২০১১। ৩০ জানুয়ারি ২০১৩ তারিখে মূল থেকে আর্কাইভ করা। সংগ্রহের তারিখ ২৮ মে ২০১৩। In Brampton, Ontario, there is a 60 metre long "Memorial Wall" of polished granite, containing individual bronze plaques which commemorate the 516 Canadian soldiers who died during the Korean War. "Canada Remembers the Korean War"। Veterans Affairs Canada। Government of Canada। ১ মার্চ ২০১৩। ৬ অক্টোবর ২০১২ তারিখে মূল থেকে আর্কাইভ করা। সংগ্রহের তারিখ ২৭ মে ২০১৩। The names of 516 Canadians who died in service during the conflict are inscribed in the Korean War Book of Remembrance located in the Peace Tower in Ottawa. ↑ Aiysha Abdullah; Kirk Fachnie (৬ ডিসেম্বর ২০১০)। "Korean War veterans talk of "forgotten war""। Canadian Army। Government of Canada। ২৩ মে ২০১৩ তারিখে মূল থেকে আর্কাইভ করা। সংগ্রহের তারিখ ২৮ মে ২০১৩। Canada lost 516 military personnel during the Korean War and 1,042 more were wounded. "Canadians in the Korean War"। kvacanada.com। Korean Veterans Association of Canada Inc.। সংগ্রহের তারিখ ২৮ মে ২০১৩। Canada's casualties totalled 1,558 including 516 who died. ↑ Ted Barris (১ জুলাই ২০০৩)। "Canadians in Korea"। legionmagazine.com। Royal Canadian Legion। ২০ জুলাই ২০১৩ তারিখে মূল থেকে আর্কাইভ করা। সংগ্রহের তারিখ ২৮ মে ২০১৩। Not one of the 33 Canadian PoWs imprisoned in North Korea signed the petitions.